This recipe could just as easily be made into cookies if you prefer. I’ve also given a note at the bottom … just in case you want to make cookies instead! Preheat oven to 375 degrees F. Grease a 15-1/2×10-1/2×1-inch jelly roll pan. Set aside. Stir together flour, baking soda and cocoa powder. In a separate bowl, beat butter, both sugars and vanilla extract until creamy. Add both eggs and beat well. Gradually add the flour mixture, beating well. Stir in chocolate chips and Whoppers candy pieces. Pour batter into prepared pan. Bake for 20 minutes or until lightly browned. Cool completely. Cut into bars. *** To make cookies (about 5 dozen) – Drop by rounded teaspoonfuls onto an ungreased baking sheet. Bake 8-10 minutes in a 375 degree F. oven. Cool slightly on the baking sheet, then remove to a cooling rack to cool completely. Just a note – these didn’t have an overwhelming Whoppers flavor … just a hint of it. They are yummy, just don’t expect a strong Whoppers taste! I’m still thinking that a Chocolate Malted Buttercream Frosting would be fantastic, too! YUMMY! Also, I want a recipe for the chocolate malted buttercream frosting now! Saving this one Jamie…My mom is going to love this! I'm so glad Diane 🙂 Hope she likes them! Mmm those sound pretty perfect to me! Okay! Whoppers would make this great! Thank you Emily 🙂 I'll definitely stop by! Oh my, these sound great! I love Whoppers, especially in baked goods! Oh yes, please, I'll take 2! 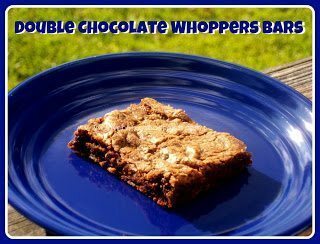 These should be called Over the Top Bars, I'm a Whooper junky, may have to use some of my stash to make these. Thanks for sharing. Pinned. I have Whopppers "phases" …. sometimes I eat 'em all mad, crazy for months …. other times, I won't touch them for months! Weird. These look so good. I must try this recipe! oh yeah, I so want to try these with the frosting! I definitely believe adding the frosting will take these from good to wow! I've really been into Whoppers lately, I LOVE Them! Thanks for this recipe, looks delicious! Yes, I would like both bars and cookies please, lol. Look so yummy. Thanks for sharing at our party this week. Thanks for stopping by Terry! I just posted the frosting today, too! Wow! Anything that starts with "Double Chocolate" is totally a hit with me without reading all the rest:) But then the rest is totally awesome also. Thank you for sharing at Freedom Fridays. LOL 🙂 Thanks for stopping by … Looking forward to Friday! It's yummy! I posted the frosting today, too! Yummy this looks so good I will need to try them soon. Thank you so much for stopping by and the kind words 🙂 Stopped by and followed you via GFC. These look really good! I think a malted chocolate buttercream icing would be delicious! Thanks for sharing at Showcase Your Talent Thursday! I'd eat anything with whoppers! Yum! Thanks so much for sharing at Mom On Timeout!